Whether you are a beginner or a more experienced player, you are very welcome to our fun recreational sessions. Shuttlecocks are provided and rackets are available to borrow. There is no need to book but please telephone the contact person to make sure places are available. Click for details . . . .
Organised by Suffolk Badminton Association. Coaching is leading to some good tournament results for junior players. Several players have won medals in Badminton England tournaments. Congratulations to Chloe Dennis (right) on being selected to play in the Under-15 Eight Nations Cup in Holland in February. questions during their visit to IBPC. Stowmarket Badminton Club are running sessions for ladies and girls at Mid Suffolk Leisure Centre on Tuesday evenings from 8pm. The sessions are suitable for beginners, inexperienced players and ex-players who fancy starting up again. There is a small charge per session and rackets are available to borrow. Please contact stowmarketbc@suffolkbadminton.co.uk for more information or phone Mary Hughes on 01359 240811. 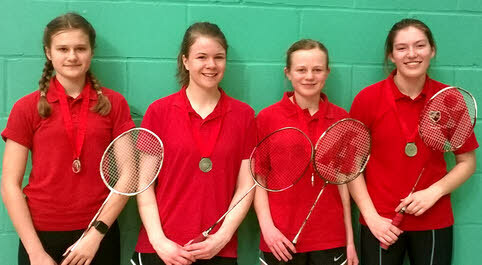 Suffolk players won 4 gold, 3 silver and 2 bronze medals at a regional tournament in Cannock. Photo: with supporters in Cannock. Casual pay-and-play no booking necessary, term time only. Tuesdays 9:30am to 11:30am, Fridays 11am to 1pm. Please phone sports centre to check whether this information is up to date, tel: 01473 612648. Organised by Kesgrave Sports Centre. No booking, just turn up, but please phone sports centre to check whether this information is up to date. Whitton Sports Centre in Ipswich (map ►) Monday and Wednesday mornings 10am to 12 noon; Fridays 10:30am to 12:30pm. Tel: 01473 433655. Northgate Sports Centre in Ipswich (map ►) Mondays 4pm to 6pm. Tel: 01473 433655. Brackenbury Sports Centre in Felixstowe (map ►) on Wednesday and Friday mornings 10am to 12 noon. Tel: 01394 270278. Suffolk Badminton Association and the Suffolk Badminton Development Group are pleased to announce the latest initiative to grow participation in the sport on a long term basis across the county. Later this year, Community Badminton Suffolk will be launched and follows successful launches in Oxfordshire, Avon and Dorset with others in the pipeline around the country. As part of the Suffolk Badminton Development Plan , SBA will be working in partnership with ‘Community Badminton’ to deliver a programme of coached sessions for grass root juniors between the ages of 5 and 13, with primary school pupils as the initial target group This initiative compliments part of the SBA Development Plan which has already proved successful with the new Badminton Hub at Skyliner in Bury St Edmunds which started last year in conjunction with Abbeycroft Leisure. Community Badminton is a ‘not for profit’ Organisation led by Director Julie Bradbury, an ex England International player with a wealth of experience in the sport. The organisation is supported by Badminton England and is focused on introducing players to the sport to grow long term participation. They will organise the sessions and seek to employ a local coach to deliver the programme in Suffolk. The programme will commence with up to 6 locations across the county where there is little or no badminton activity for these age groups. The initiative will look at an exit strategy to keep the players active in the sport by establishing links to senior clubs who are open to receiving junior players from the age of 13 who will already have some knowledge and experience of the game. The teams went on to compete in regional finals in Cambridge. medals they won in the regional finals. Wishing to join a club? Contact: Peter Webb 01394 386452. £3 per session (students £1.50). Sessions 11th Jan to 12th April plus 26th April and 3rd May. Contact: Andrew Baker 01473 286007. (Organised by Andrew Baker April to August). Contact: Alan Hughes 01473 823517. Mondays 8pm to 10pm. £4 (students £3). Sessions 7th January to 15th April 2019.